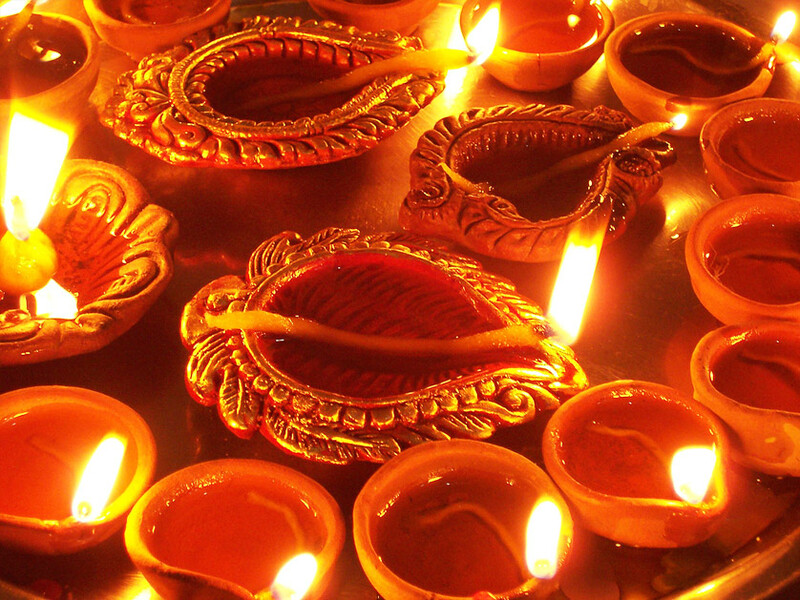 Diwali, the brightest and biggest festival of India signifies the victory of light over darkness. It’s the time when friends and relatives visit you and the card game is played in full frenzy. 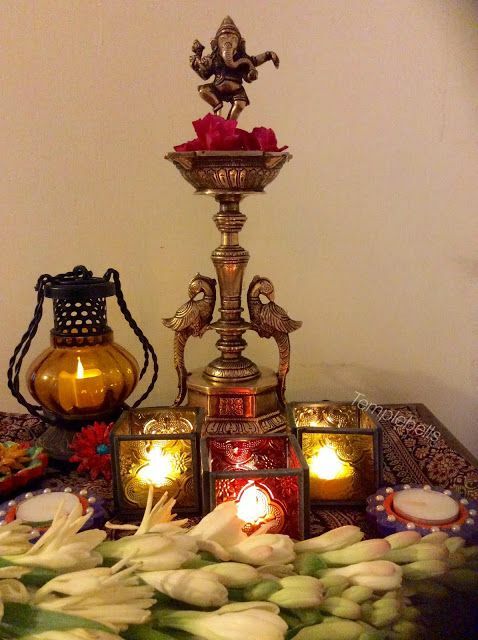 But there’s another thing which is of vital importance during Diwali and that is decoration. Since this joyous festival is around the corner, it’s time to start cleaning up the place and decide the theme of Diwali decoration. Below, we’ve compiled some of the most gorgeous and unique Diwali decoration ideas for 2017. Take a look. What comes to your mind when you hear Diwali for the first time? Diyas or lamps would be the answer of most of you. 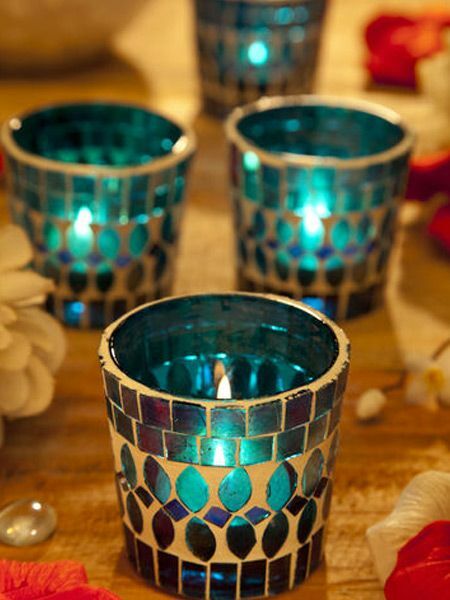 Before arranging the lamps on the platter, paint them and decorate with glitter or ornaments. You can even place tea light candles inside the lamps. 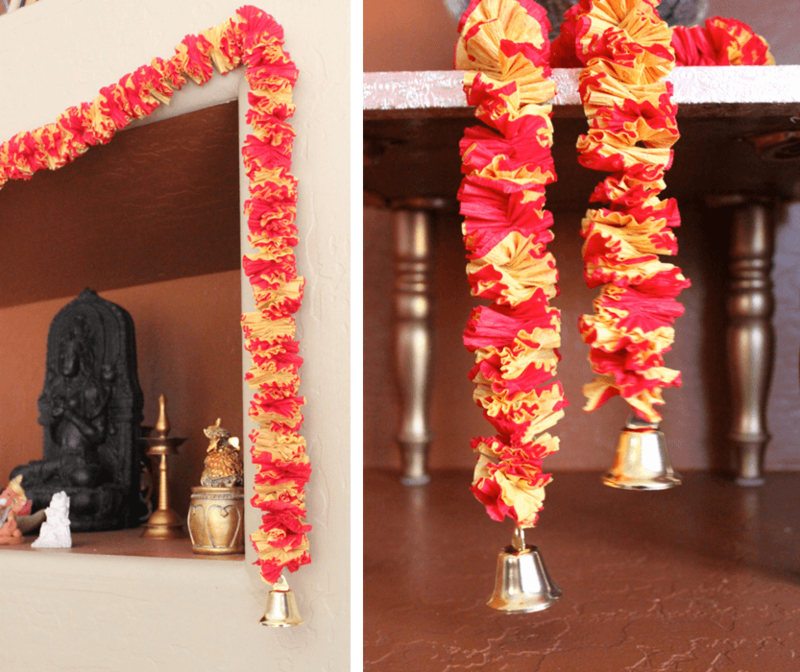 Toran is a door decorative item made using mango leaves, marigolds and strings. But if you cannot get hold of the supplies, you can make them using paper, as shown in the picture. 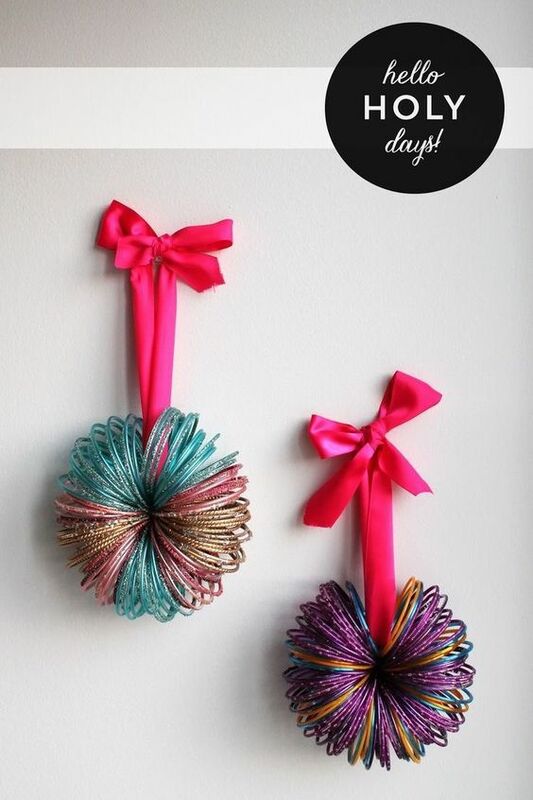 Don’t forget to hang a bell at its end, to make it look traditional. You must be having a prayer room. So don’t forget to deck it up for Diwali. If you don’t have a prayer corner, you can set it up at the entrance so that everyone can take the blessings as soon as they step in. This red metal lampshade with an LED light will fill the house with a warm glow. We feel it will look great for study rooms or bedroom. It’s sure to add joy to the festivity. 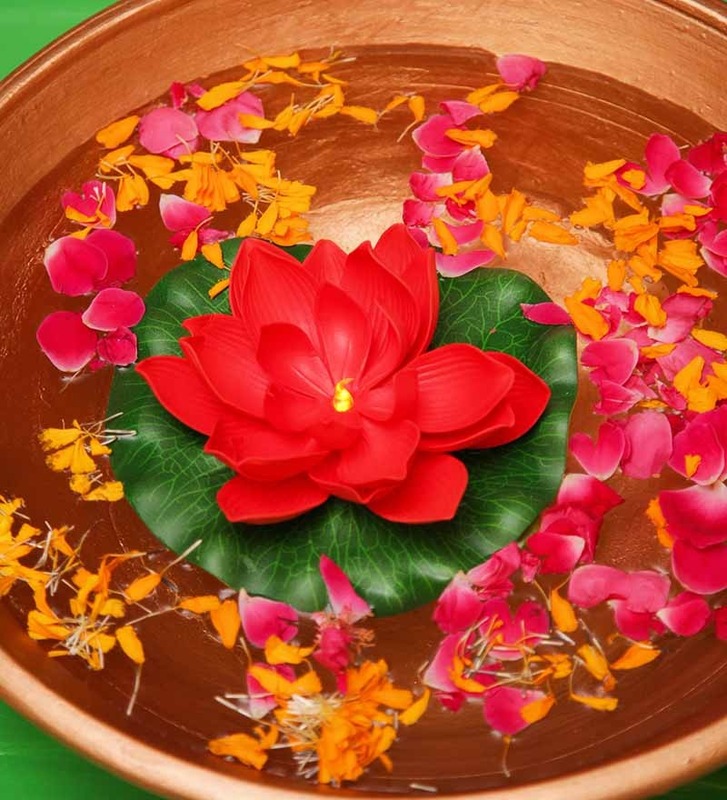 If you want something that can last you years, go for this lotus shaped floating candle. It will not just enhance the décor and add elegance and style, but will even fill the house with Diwali vibes. 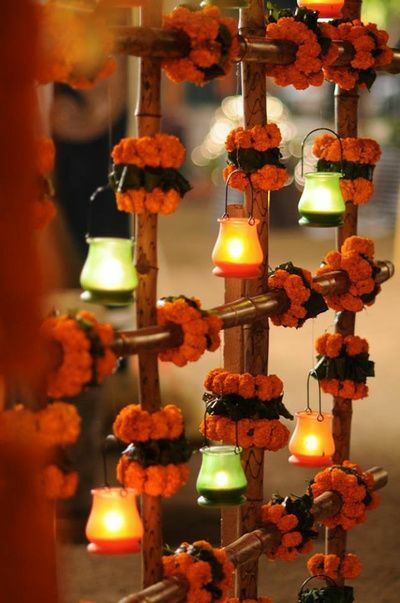 This is one of the most interesting ideas we’ve seen for Diwali decoration. Instead of traditional lamps, you can use decorative clay pots. Ask children to paint the pots. It will make a great craft for them. 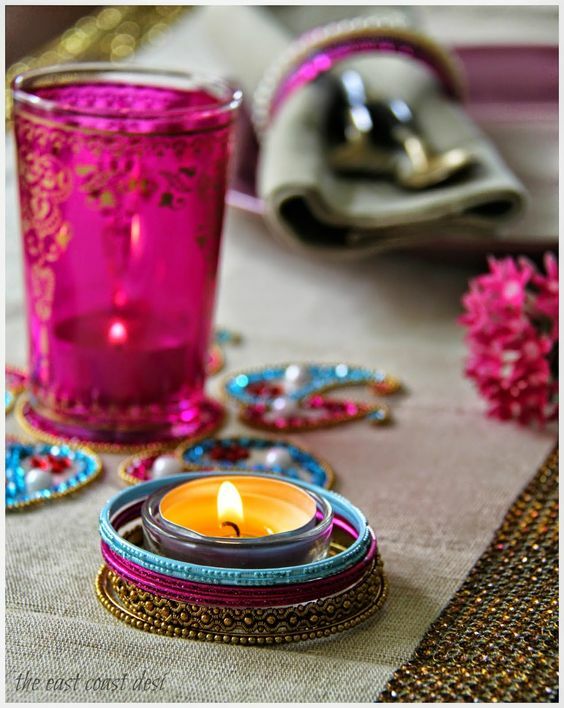 Here’s another interesting Diwali table decoration done using bangles. You just need to ensure that everything is color coordinated. 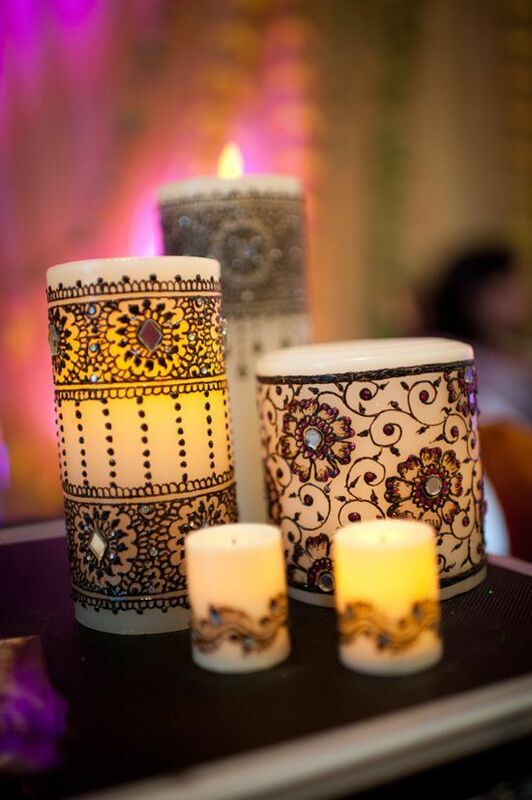 If you’re short of space or are not traditional at heart and want to try something different, you can make use of decorated candles. It will create a huge impact. You can even do variations in light decorations. 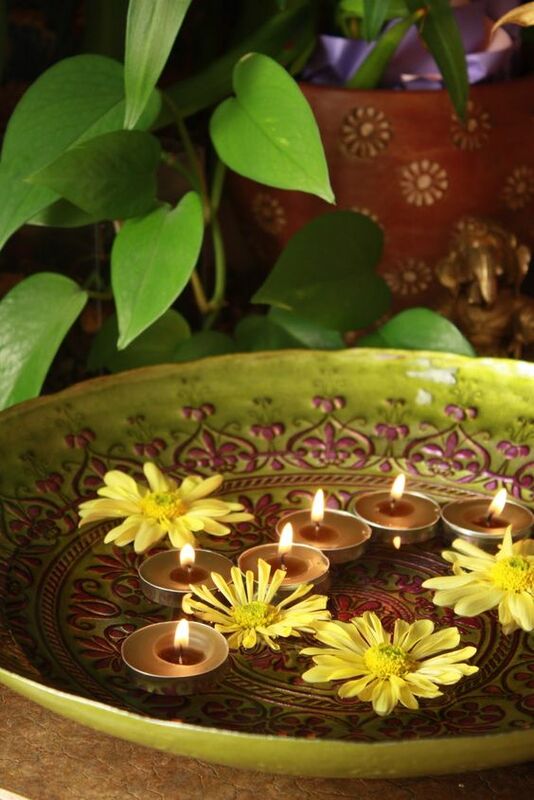 Instead of piling on diyas or lamps, place tea lights in mason jar or any glass jars, earthen ports or a traditional diya. This is a relatively simple idea, which you can do by clubbing or forming a flower shape from the bangles. Then hang it from a wide ribbon. Instead of diya, you can even go for floating candles. You just need to fill a bowl with water and put the floating candles in it. Add some flower petals to it to make the house smell great. 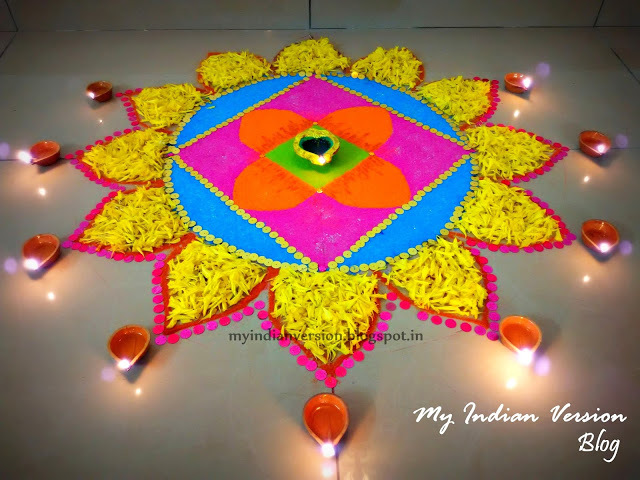 Rangoli, the age old tradition of decorating the house is always in trends. It’s totally up to you on how you want to decorate it. 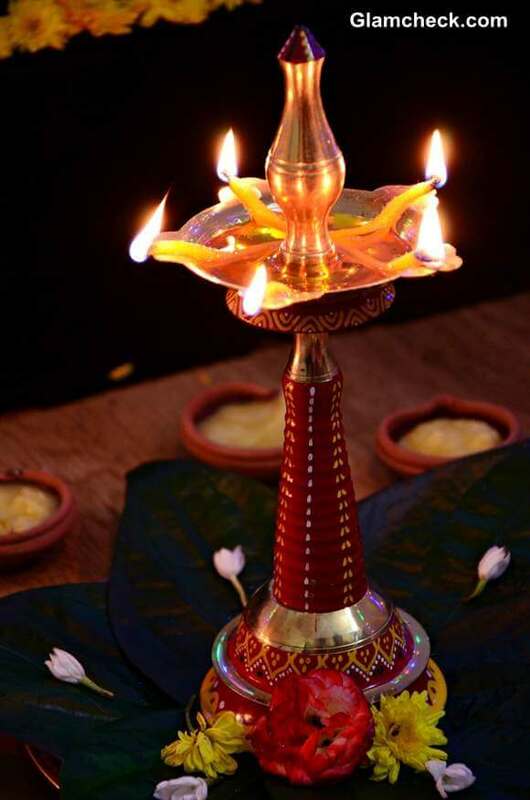 Earthen pots and diyas are generally used for decoration. 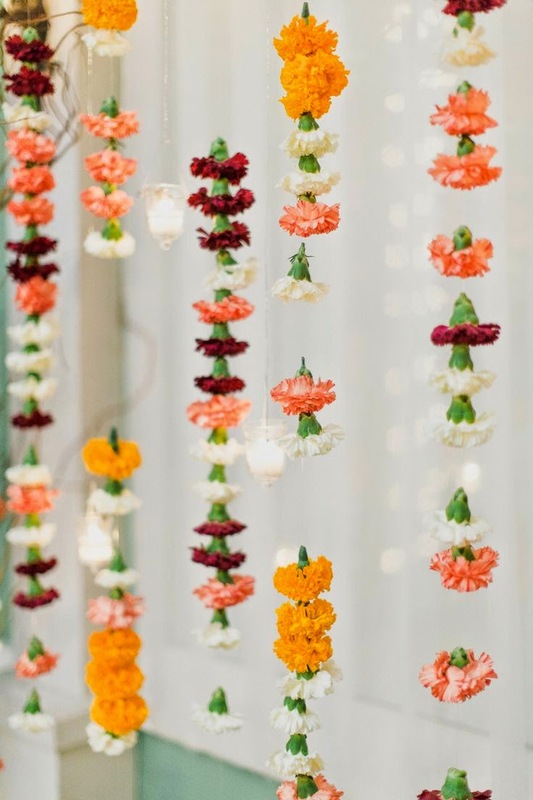 Indian festivals, including Diwali are incomplete without floral adornments. Marigold, especially are used during Diwali by weaving them in wreath or garlands and then hanging them on the walls or from the door. It will make the decoration come alive. Or wrap it around bamboos, as seen in the picture. 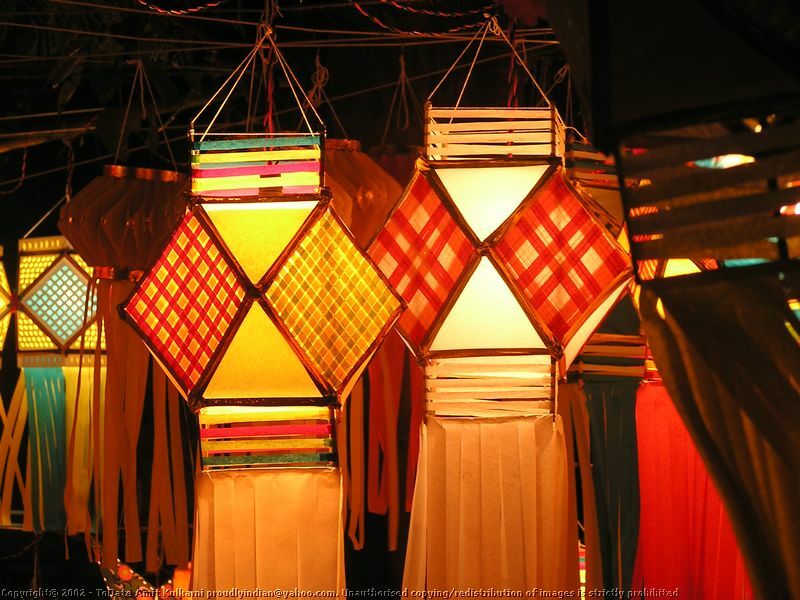 If you don’t mind going the oriental way, you can hang paper lanterns for the decoration. It will look exotic and beautiful. 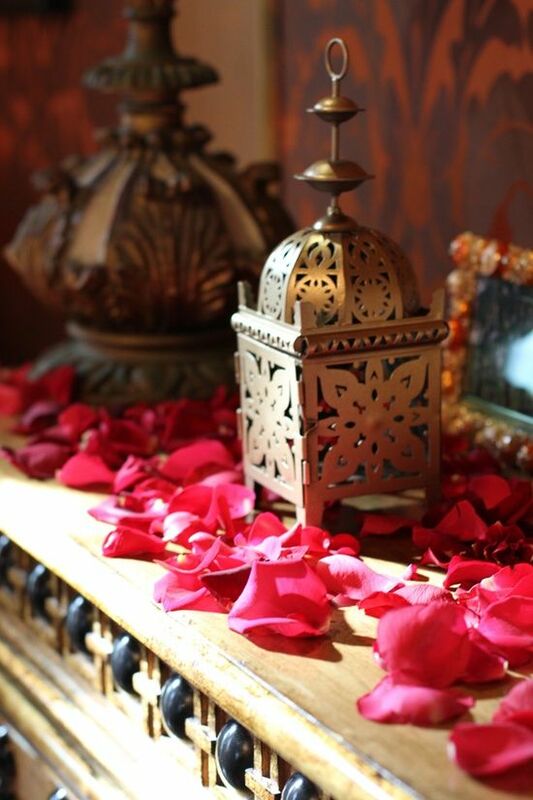 A simple floral decoration can go a long way in beautifying the house. 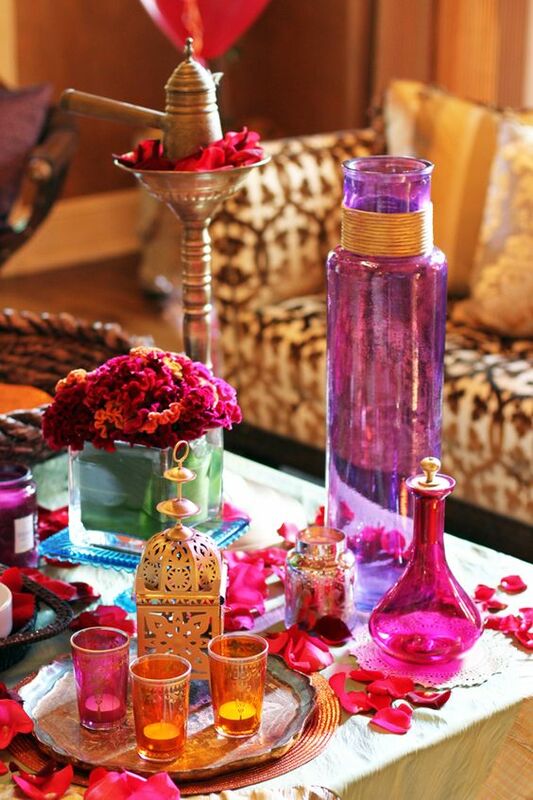 Just place a bunch of flowers in a brass or silver vase and put it on display. 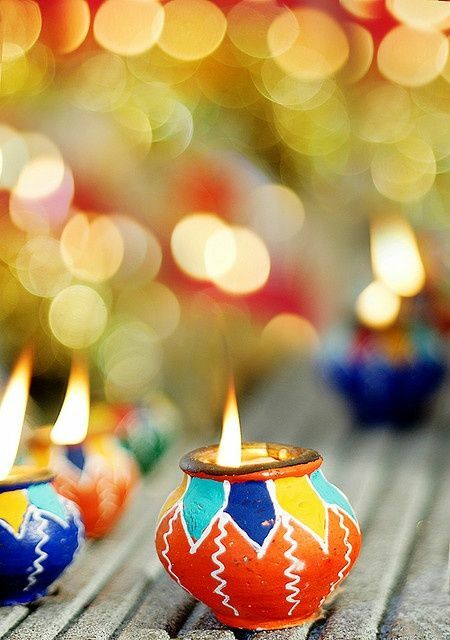 If you want, you can even take inspiration from Morocco for your Diwali decoration. Try to color coordinate the vase for maximum effect. 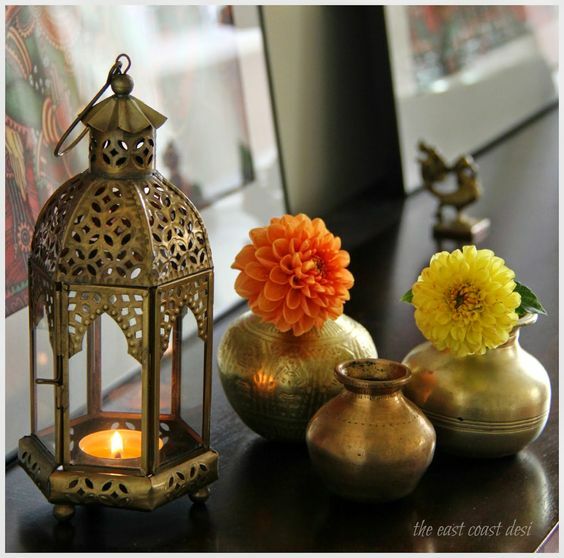 Metal or brass decorative items go very well with Diwali. 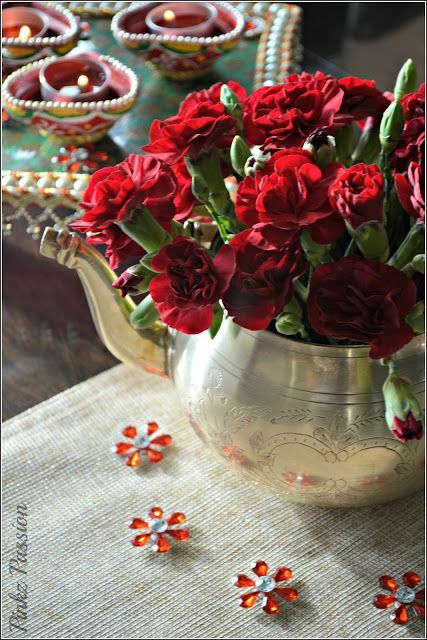 Just as you can see here, brass kundas with Dahlia tucked into them will look great placed on the table or shelf. 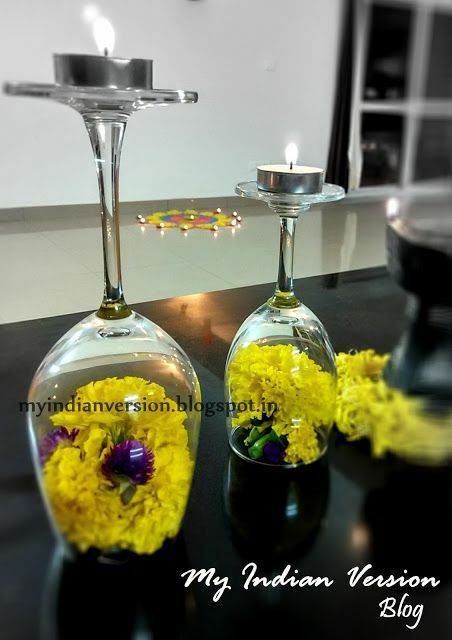 Who would have ever thought that wine glasses can be used for decorating the house during Diwali? Tuck flowers inside the wine glass, reverse and put a tea light candle on it. You’re set. 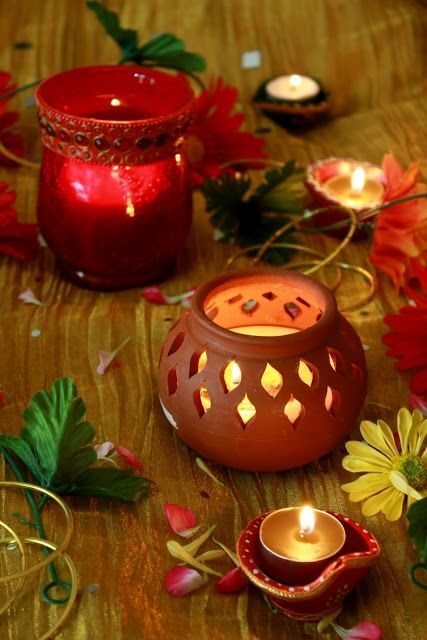 For an easy and quick Diwali decoration, put tea light candles in small and decorative glass and put them on display. This is exactly what we were referring above. 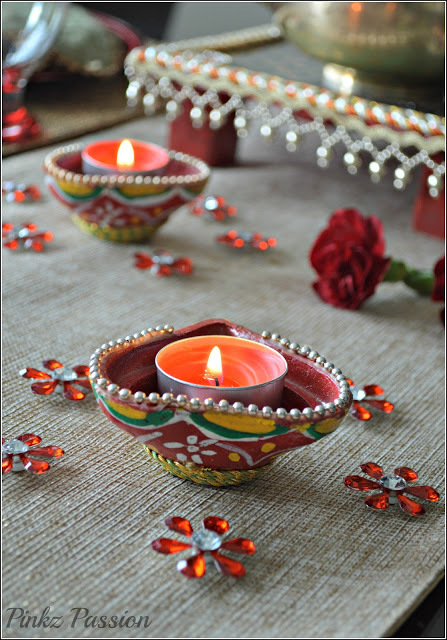 Decorate earthen diyas in best way possible, place tealight candles in diya and put it on display. This is definitely an eye candy. And is very easy to recreate too. 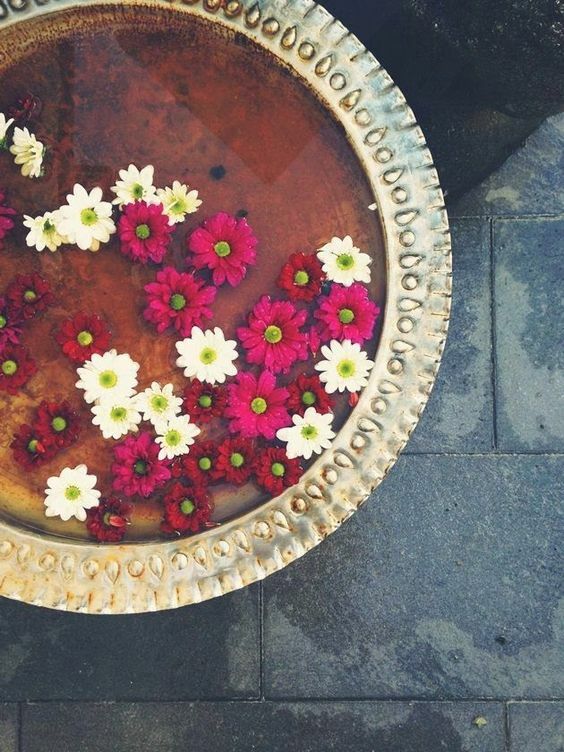 Just place some flowers, real or fake, in a copper or metal vessel and put it outdoors. 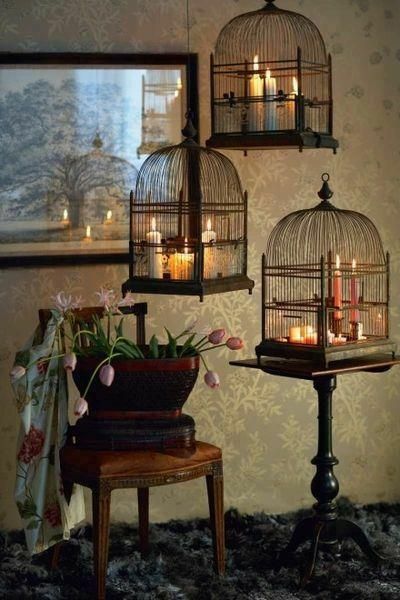 If you want to give a modern touch to your décor, place the candles in a cage and put them on display. You can even hang from the ceiling if you want. 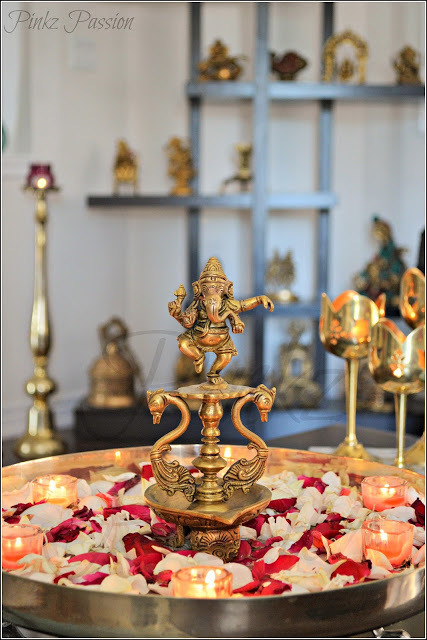 This Ganesh lamp, placed on a shallow plate filled with flower petals and tiny candles, will increase the beauty of your house manifolds. Here’s a relatively simple design for you to emulate. You can try with different flowers, but don’t forget to incorporate marigold flowers in it. 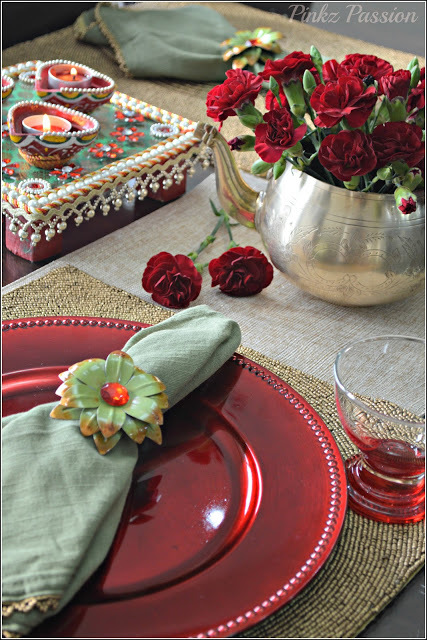 Add some glitz and glamor on your Diwali dinner table with a golden placemat. The red plate is making it look even more festive. 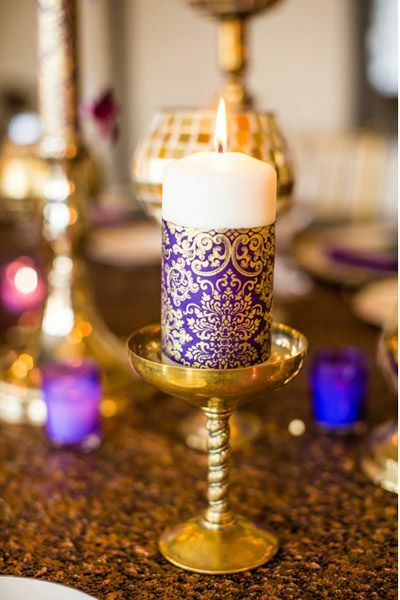 This candle, draped in purple and gold handmade will transform your house in a palace for Diwali. It’s exemplary. Diwali decoration and Puja would be incomplete without these beauties. So get hold of a similar one right away. These Diwali decoration ideas for 2017 will transform your house into heaven. How are you planning to decorate your house for Diwali in 2017? What Diwali decoration ideas for 2017 would you suggest our readers? Let us know by commenting below.